It’s been a unique season for the boys’ JV basketball team. With 16 players on the roster, the team is divided into three separate “squads,” with only two squads suiting up for each game. Despite the unusual format, the team has developed strong chemistry on the court and players have shown marked improvement in their individual skills. 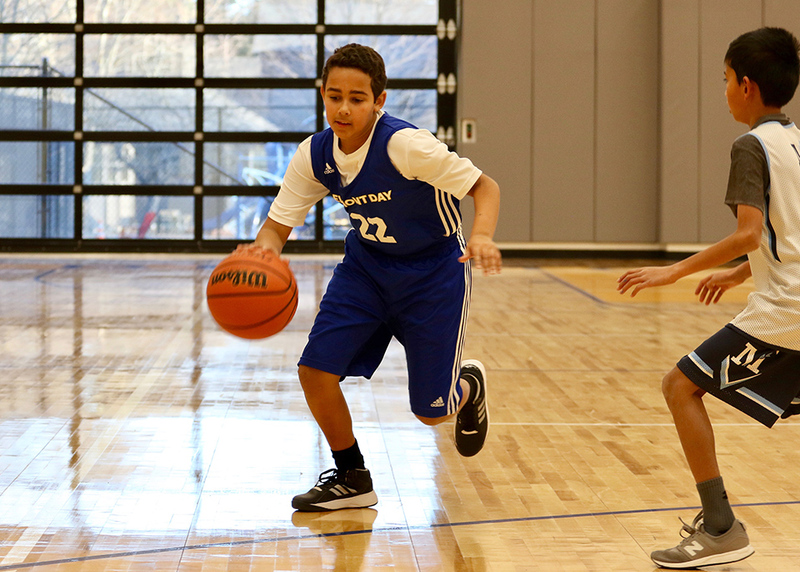 This past week, the team played hard against DCD and Rashi. On the road against DCD, Alexander Colangelo poured in a game-high 16 points while Quinn Foley’s aggressive defense spurred a Blue & Gold comeback. At home against Rashi, Issac Frehywot was hustling on both ends of the floor and classmate Noah Brauner did a great job handling the ball. The team will look to get back to their winning ways next week at home against Fenn. Bree LeGrand and Susanna Kelman were instrumental during girls’ JV basketball’s lopsided road win against Rashi this week. Every player scored for the team’s second win in a row. The boys’ varsity basketball team improved to 5-0 with a 47-31 win over SSDS this week. Miles Sandoski knocked down some big shots and showed great composure running the point. Scott Abbott (sabre) and Jacob Stephenson (epee) fenced well for the home team, but it was Paul Lyons who stole the show with a dramatic 5-4 victory in the final bout to secure a 14-13 win. With two more wins against Park, Theo von Gottberg remains undefeated on the season for the Blue & Gold wrestling team. Philippe Pitts and Evan Seymour also wrestled well. The girls’ varsity basketball team received a solid performance from co-captain Sophie Dornstein, but came up short (31-25) against a talented SSDS squad this week. Noah Kokinos continues to improve his strength and accuracy for the badminton team, while Ripley Bright’s strong racquet skills have led to longer rallies during her matches. Aaniya Riddick shined for the gold squad during this week’s volleyball match. On the other side of the net, Jazmin Cruz served her team to a win and a 2-1 victory overall. ©2019 Belmont Day School. All rights reserved. Saturday, May 4, 2 to 4 p.m.
Join us for an outdoor obstacle course, face painting, crafts, refreshments, an animal experience, and the ever popular Jeff Jam performs at 3 p.m. Free and open to the public!